The NEST starter pack is absolutely free and you get a lot of advanced charting tools and features. 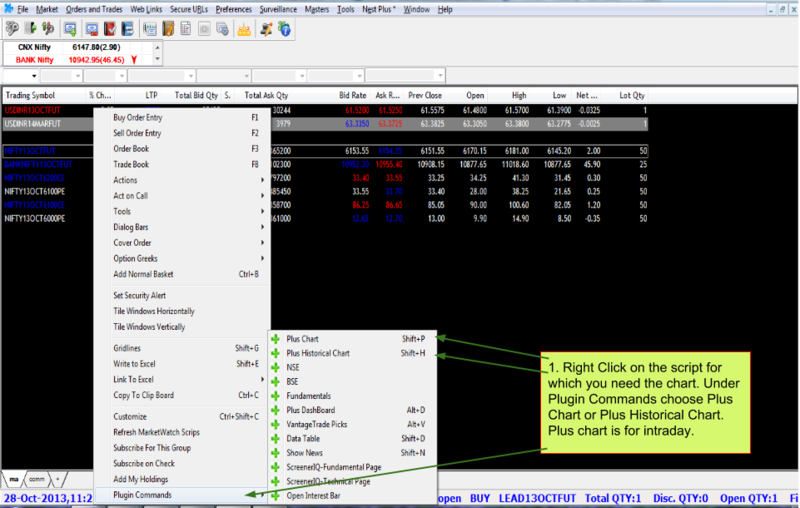 To start the charting tool ensure that you are logged into NEST Plus on Zerodha Trader, by simply checking the option on the log in screen on the software. Note – You need to be registered for NEST Plus to use the charting tool. If you are not then please check the following link for more information. This should help you get started with the charting tool available on Zerodha Trader. As you will see there are many advanced indicators available, different styled charts, etc. As and when you get proficient in Technical Analysis, you will be able to make best use of all these features. Vasu, we are constantly trying to improve, appreciate your feedback. 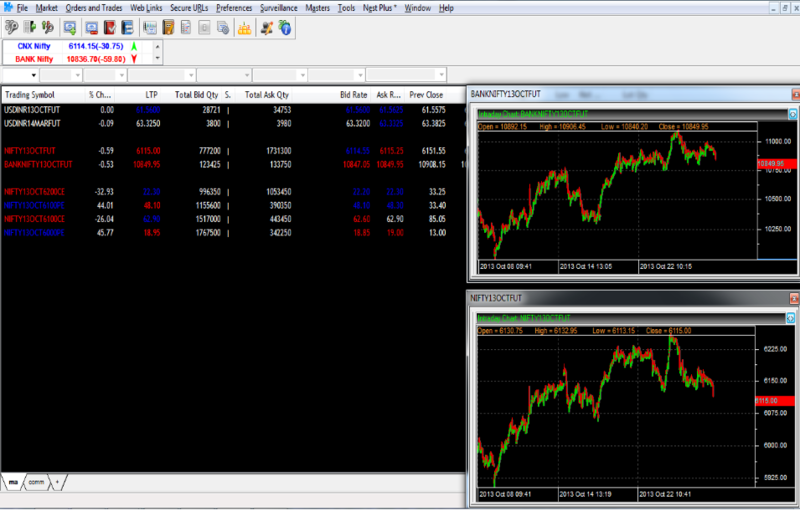 I am using NOW.exe to trade USDINR contracts in NSE. My chart service provider has charts for MCX-SX only. Can I utilise this Nest starter to view USDINR-NSE contracts? Yes you can, but you will have to first migrate to Zerodha Trader platform, so if you don’t already have an account, you will have to open one with us. I think there was a mistake in domain name in Email address in my previous comment. Corrected it. I have migrated to ZT. Bringing to your notice my observation on first look. 1. For USDINR-NSE contracts, price is specified upto four decimals, but in VWAP statistics, O/H/L/C and VWAP are rounded off to two decimals though shown in four decimals, for eg. 55.1500. 2. Keyboard shortcut for VWAP statistics,”Ctrl+Shift+H” is not working, have to right click on scrip–>Tools–>vwap statistics. Please see if these can be rectified. I opened the chart, but was unable to add indicators to the chart and if i save the template and upload it again all indicators are lost and again i have to add indicators, can you please let me know if any issues or settings i need to check or rectify. Zubin, presently all the indicators that you add cannot be saved.. Everytime you logout and login, you will have to add it again.. we are working on fixing this issue..
Is their any charges involved for using nestpus, if are there please share the details. @Raj, as mentioned in the blog, the starter pack is free of cost, advance tools like Pulse has a cost. You can visit plus.omnesysindia.com to see the various products and their pricing. What are the features in Pulse tool, that are not available in the free Nest pack ? wanted to know the chart types that are provided free and what are charged.. I want to know the features of the indicator, if i am clicking on the help button it is showing no response (Ex : Indicators>> Aroon>> help no response) if i want to know the features of these indicators what is the path or method ? All the indicators provided on the charting pack is commonly used indicators and you can research on google on what each indicator actually does..You might find a lot more inputs on these websites that focus on TA. 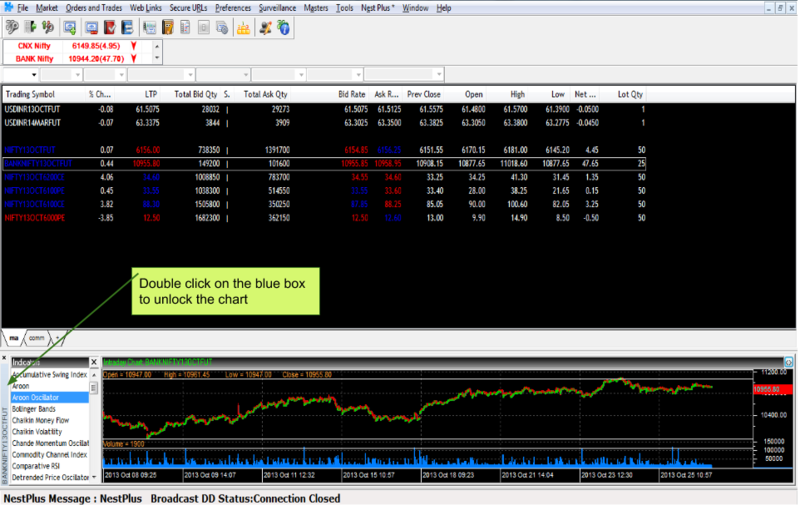 ztrader chart, when I click zoom in, it zooms in, but it vanishes current data, it goes backword.Please guide me. 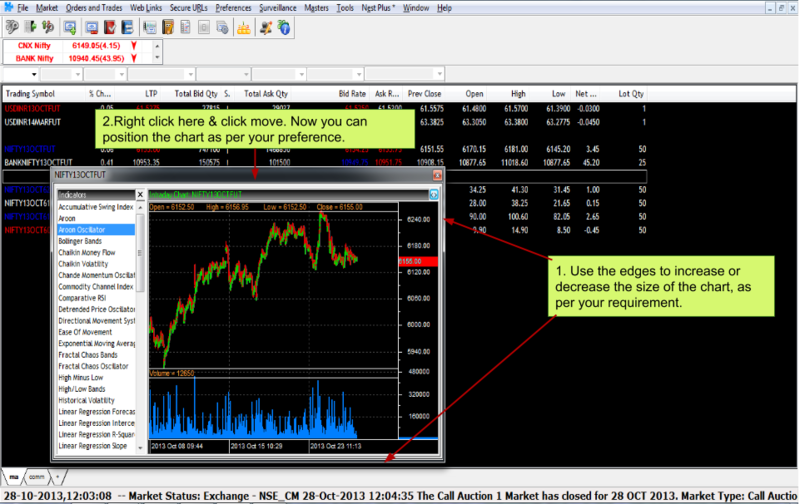 Try it… Also, if you would like to view all chart data at once, press Ctrl + X. In z chart when I click on particular indicator, message says “key not unique”. Please advise. The ‘key not unique’ message comes about if you’re using Windows XP as your operating system. I would suggest you upgrade to a more recent operating system, maybe Windows Vista or 7. Nestplus not opening. After id and password, it hangs. Prabit, try getting in touch with the NEST Plus helpline directly on 08246612248/65/66 and they’ll be able to help you with this issue. As mentioned on step 7. Once i save a templet on how many charts can i upload the templets. I was could upload the templet only on the 2 charts. Its not working on the third chart. It should work on multiple charts, upto 6 I guess. This would also depend on your system speed and internet connectivity. How to write own scripts (eg. ma crossovers) in nest plus? any technical help? You will have to subscribe to this product though!! 1)Does the web based trading platform with Zerodha offer all the basic charting tools and the required indicators for Intraday?. I see lot of sites talk about Charting Platform being a separate feature from Trading Platform. 2)Also, I see a lot of sites talk about Amibroker/Nest Plus Plugin – Do we really need to subscribe for those or are they optional?. 3)Also, what about the data feeds? Should we subscribe by paying per month/Quarter/Semiannual/Annual basis?. I see a lot of references on Global Data Feeds. Last but not the least, is Zerodha Trader (web based/Software based) is all that we need for Intraday Trading? Please clarify on the above and I thank in advance for the time that someone may invest in responding back to the above. firstly Zerodha trader is our software based platform, Z5 is our html web based platform, both of these are different. The software platform will definitely be the first choice, but if you cannot install platform because of firewall issues or internet speeds, the Z5 will be the better option. 2. Amibroker/plugin is optional. You can subscribe to this only if you need to do advanced charting. 3. Datafeeds will be required to use Amibroker and what package you choose is upto you. As a zerodha client you will get a discount from them. But as I said earlier this is optional. I got my questions answered 🙂 Thank You very much for a quick response. Yes Anees, The tool can be used simultaneously while trading. Yes we give intraday data for upto 7 days, so you can look at 5 minute candles for upto 7 days. We will soon have a section on Zconnect where we will explain you on a tool where you can put a technical analysis strategy, backtest it and also take it live for semiautomated trading. Keep tracking this section..
1) I am using the RSI Indicator on a new panel in the Chart. Cant I overlay the RSI over the Price Chart (just like I overlay SMA or EMA)? 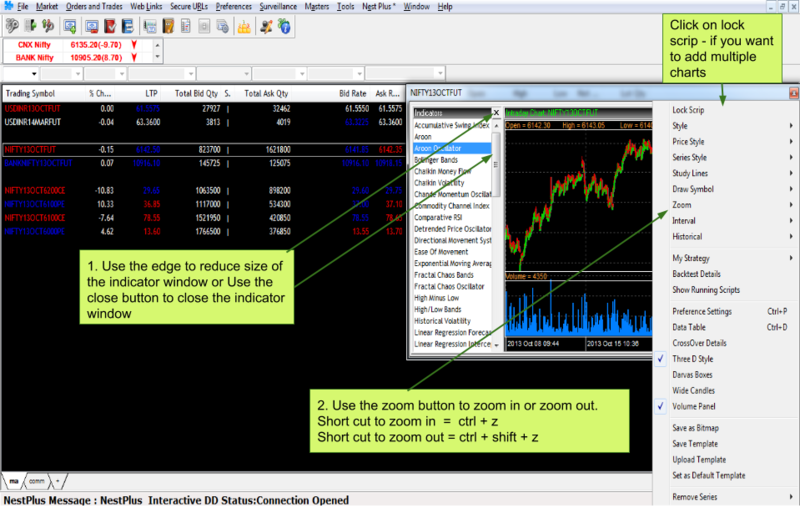 2) If I am using RSI Indicator, how do I add a signal line such as MA of the RSI to the same panel? How to save my own strategy.I would like get alets with help of that saved strategy. how to enable zerodha plugin in nest plus? NEST PLUS is already on trading platform, there is no need to enable Zerodha Plugin. You have to subscribe for that, do get in touch with the Global datafeeds team which will help you out. I saw that we can look at the charts of stocks and F&O. But no where I am able to look at charts of actual nifty/sensex/bank nifty etc. Param, you can look at charts of only those that can be added to the marketwatch. Presently indices can’t be added, so you will not be able to look at that chart. You could look at Nifty futures chart or NIFTY BEES chart, both should actually show depict the underlying nifty..
Is it because Nifty as an index is not tradable and ZT being a trading software and not charting software? Is it possible to add them as feature taking request from few customers? We are looking at having charting on index soon, will keep you posted. Is it possible to get NIFTY index charts in ZT? Not on ZT, but on PI which is currently in beta. Is it possible to view Weekly and Monthly charts in Nest Plus Starter Pack. If not, will it be available during future upgrades if any. We still don’t have an option to view weekly/monthly candlesticks on ZT. The best option right now is you can get daily chart data for over a year. To view daily charts, please right click on Nest Plus Charts and choose Historical. In Historical, you can set you time frame. I am unable to login to NSE mobile application. It is asking for member ID and User ID. I typed the member i as 13906 (taken from internet) and user id as DM0756 (Client code) but I am unable to login. You would need to download the Zerodha Mobile. trade.zerodha.com/download is the link to download that. On the Zerodha mobile, you can trade on all exchanges whereas NOW is only for NSE. i am not able to open historic chart its showing “error request unknown. please contact administrator”. is there any option to view a chart showing buying and selling quantity of a script, on an intraday chart? You need to first open Plus chart as shown above. Once this chart is open, right click on it and click on historical chart. When you right click you also get an option ” Volume Panel” , will show the volume chart. i have downloaded nest mobile trading software in my tab.. but pw error is coming,, my id is RN0461. http://www.zerodha.com/z-connect/blog/view/nest-plus-registration , you can check this blog, explains the registration process. Also the blog above explains the process, if you still have any issues call up 080-40402020, they will give you a demo. By default nest plus would show 22 days chart with intraday data. You can zoom into it until it shows only 1 day chart. Going live on 1 day chart or 22days won’t make any difference, it will just be the same. When you go live, alert preference is what matters and not the chart you are looking at. Check this blog for more. Thanks problem solved by reinstalling. and “OTP Connection error: 0″… and the problem many time I face is ZT hangs during Logout…can you please look into this issue ASAP.. I am not able to trade now.. I plot 34 EMA on 1 hour/2 hour and 4 hour chart and use it as part of my study. However in Nest the data is shown only of 22 days. Hence its give a message of invalid period when I try to plot 34 EMA on higher period. Can I increase the number of days? The intraday data presently is given only for 22 days and hence a higher period is not possible. But you can check out the historical chart which is a daily chart. I have to seen a message like below, What was that? You can ignore this message..
is there any way to save drawings such as trendlies, fibonnaccis on charts like we save templates for indicators. How do you even put fibonnaccis? I dont see them in my list of tools. This feature is something a lot of traders may desire but it isn’t yet available on our trading platform. We’re gonna look at adding this as a feature on a later date. As of now you can see intraday data for 22 days at a stretch. If you want data older than that, you have to save it on your trading platform. I am frequently getting error message when i open NestPlus Historical Charts. Particularly on sundays, and late evenings the charts throw this error. Pl suggest in resolving it permanently. To view historical charts, you have to first view Plus charts (shift + P) and then within Plus charts, you have to right click and view Historical. This will work. I am unable to open Nifty chart or any Index chart.. please provide me the step by step process on how i can open Nifty intraday and historic charts using NEST Plus in ZERODHA Trader..
We still don’t provide index charts on Zerodha Trader. This will be made available with the next release of Zerodha Trader. For now, the best places to view intraday and historical index charts are Google and Yahoo finance pages. Can u confirm by when we can expect the next release of Zerodha Trader where we can get live index charts….am waiting eagerly for the index chart on Zerodha Trader….Would be really helpful..
We have tested the index chart option on Nest Plus but have refrained from adding it. The main reason we hadn’t provided the index chart was because we already had a futures chart available on the index and everybody uses that for trading. The request for index charts is very limited as this is freely available online on a dozen websites live. We’re looking at having the index chart available for our next software release. Still, analysing index charts is necessary, particularly historical charts, by adding some study lines to it. Futures chart are better for analysing intraday charts. hi does the chart shows pivot, support and resistance points for intraday ???? Is it possible to view Nifty Futures Charts and other “Options Charts” using ZT? If one needs to trade Futures and Options, then intraday charts are a must have. Please clarify. in commodity market(mcx,ncdex)….nest plus platform provide continuos chart data….weekly and monthly chart..
i have zerodha f&o account, i use trading platform now software. how to i login nest trader. thanks in advance. I don’t see PLUGIN option when I left click on the script. I have follow all the instruction given in this blog. Suggest how can I get the charts and other Nest Plus features! There is an option to square off from the admin position window, you just have to click on the position, and click on the square off at the right bottom on the admin position window. Check this blog. I have Nest Trader from another broker and your Zerodha Trader also looks similar to Nest Trader. I want to open an account with you and If I install your Zerodha Trader, will this conflict with Nest Trader already I have from another broker while I am using both simultaneously. (for some reason I have to keep Nest Trader for some time). Please clarify. Shouldn’t be an issue, just follow the installation process as explained on this blog. I am client of Zerodha and also client of BMA wealth. Now my issue is that both companies are providing NEST TRADER, So how to install the softwares of both ?? If i am installng both the softwares , i am unable to login with both. This blog explains how to install 2 different versions. Firstly reduced charges is a great news. thanks. My query relates to nest charting. When I tried to add 3EMA and 15 EMA in a daily live chart, 15 ema not seen in the chart. How to solve this. I want a crossover of 3EMA and 15 EMA in a Daily live chart. Please help me out. 1) We draw trendlines/horizontal lines in charts. Please allow me to save it as templates like indicators so that next day we don’t have to redraw those trend line again. Forget next day, even if the chart interval is changed those study lines disappear. 2) Atleast provide weekly charts if you cannot provide monthly/quarterly/annual charts in historical charts. 3) Allow maximize / minimize option in charts. 4) Please provide historical charts for index charts. How can you term it unnnecessary because you are providing futures charts ? Hi How to save my study lines in charting , suppose if i add horizontal line or trend line after saving the template, when i restart the same script and try to upload saved template it will start as new script without any study lines , so please help. .. 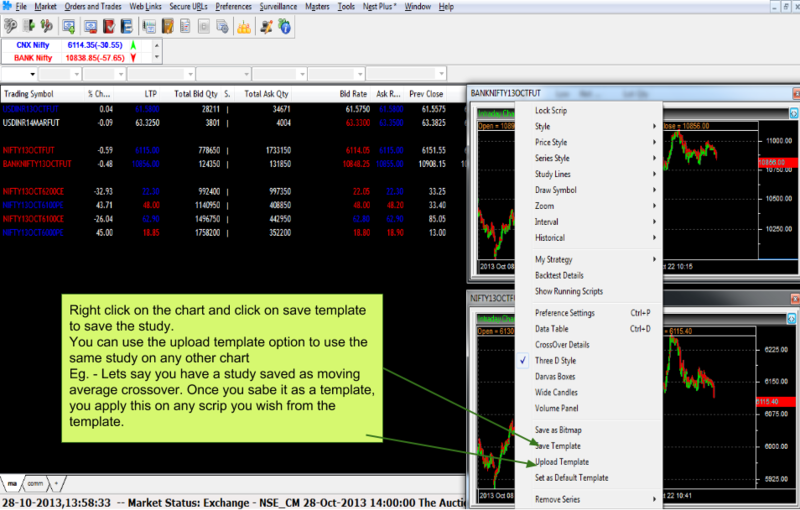 Right now, you cannot save study lines on your charts for future reference. The best option for you is to add any indicators you wish to use and then save the template with those indicators. After this is done, you can load the template every time you want to make some studies. To clarify again: You can save indicators as template. You cannot save study lines (horizontal or vertical or trend) as template. Hi, Is it possible to toggle between chart and market watch screen? Hi, Does it have a facility of viewing continuous chart for 3 to 10 days in time frames of 5 minutes, 15 minutes & 60 minutes? Is it possible to switch from one time frame to another quickly like MT4 charting tool? If there is a separate charge for such facilities, please inform how much would be the cost? On the present platform it is not possible, but our new trading platform should have this. Can someone kindly confirm the following? 2. One hour tick intraday charts are not available. how can i shift from NOW to ZT? yes sound alerts still not working, but will be on our new platform. I have some technical problem with my trading software after updating it to Omnesys Nest Trader Version 3.10.57.97.7 from Omnesys Nest Trader Version 3.10.57.96.1. Sir, is it possible to save ZT layout, say with multiple charts? I wish that when I login again, same 5-6 charts in same marketwatch appear automatically. Also, can I save 5-min as the default interval when a new chart is opened? Not for now, but our new platform will have this option. Prem, historical charts work on Nest Plus as long as the stock has had some history. I’d suggest you upgrade to the latest version of ZT which is 3.11.2. This is available on our downloads page. Once you’ve installed the latest version of ZT, you will be prompted to upgrade Nest Plus to 2.9.0.0. If you do this, you should not have a problem getting historical charts with all the other basic features. If you’re having problems with installation, do call our support number for assistance. We’ve also asked one of the engineers from Omnesys to get in touch with you and I guess they should contact you within the hour. In the meantime, please make sure you delete all older versions of ZT and are upgraded to 3.11.2. Check out this image. It’s Reliance historical chart. Thanks Hanan. Upgrading to 3.11.2 fixed this issue and Omnesys engineer called to confirm that my issue was resolved. I wish everyone in Zerodha support team worked like you but that doesn’t seem to be the case, at least from my experience in the past few days – I’ve called up zerodha support to inquire about the negative balance in my trading account because last time I traded, which was around more than a year ago, there was no debit balance. The support created a ticket for this rather simple issue (ticket# 692531) and it’s been more than 4 days now and I still haven’t got any answer from the support team inspite of my calling them 3 times in the past 4 days for this ticket. I just wanted to resume trading after a long gap and looks like the support team doesn’t want that! Hmm.. will have to check. Can i expect zerodha trader with interactive charts with all the indicators for intraday on an android tablet sooner??? I work in a s/w org and cant install the zerodha trader tool to watch the live interactive charts and in the zerodha mobile as well i dont have this option. The in house mobile app will take a bit longer, there is an android app on store, have you checked that? Vidya, If you want to buy at 1010, you will need to use a SL order to enter. So choose the SL option and keep a trigger of 1010, so when price moves to 1010 your order gets sent to the exchange. Check this post for more. I am trading using the intraday 15 min chart in ZT, 3 days ago I upgraded the Nest Plus from 2.8 to 2.9. I am getting two problems after installing this version. First I couldn’t see the 15 min timeframe and Second is the chart screen is Blinking as price fluctuates. I called Zerodah Care but not solved my problem. Please provide the inclusive list of feature of Nest Plus available to Zerodha customer. If you are having problems doing a clean update of Nest Plus, please read on. Download the Nest Plus 2.9.0.0 (zip) file from this link under the heading Utilities. Ensure you’re using Version 3.11.2 of Zerodha Trader. Once downloaded, you will have to unzip the folder, then open the folder Nest Plus 2.9.0.0 and copy all the contents. Go to C://Program Files/Omnesys/NEST3 or C://Program Files(x86)/Omnesys/NEST3 and paste all the copied contents into it. While pasting the copied files, you will get a prompt “Confirm Folder Replace” for which you have to choose “Do this for all current items” and click on Yes. Once you’ve clicked on Yes, another prompt to Copy File would pop up for which you have to tick “Do this for all conflicts” and then select the Copy and Replace option. Once the above procedure is followed, your Nest Plus plugin would be upgraded and you should see black charts. 2. On Plus Dashboard check if your client ID shows up on top. If it does, great. *Note: This works only on your Zerodha account. If this still doesn’t work, please feel free to write back our call our support number. Maybe you tried getting in touch with our support number during peak market hours. Some of our clients are having a tough time updating Nest Plus, but don’t worry about it. We’ll get someone to get in touch with you and assist. the chart is not supporting to save or upload the templetes of my indicators now…. i have registered this issue by phone call to zerodha, but still no development. Uday, our vendor Omnesys – Thomson Reuters, have made some changes which is causing these issues. We are talking to them to have this fixed asap. Your team have helped me with every baby step for proper installation. It’s very important to note that if you are a Zerodha client who has been mapped on Nest Plus directly you will see black charts and you will be able to automate your trades using algoZ…. Download the Nest Plus 2.9.0.0 (zip) file from our Downloads page. The file can be seen at the bottom of the page. Ensure you’re using Version 3.11.2 of Zerodha Trader. Do NOT use the older version. Wow, that’s a tough one. Since you’ve already tried what we’ve asked you to and it hasn’t worked, it’s time to call in the supermen and batmen of Zerodha. Someone from our support team will get in touch with you soon. Congrats that you trading account is already open with us! It’s just a matter of time before your demat account is open as it takes longer to open a demat account due to additional checks required. If all documentation is accurate, we presume your demat account will be open within 5 working days. white background chart issue will get fixed at all ? or that we should wait for the Final Pi release and give up on Nest Plus altogether? Please clarify if it is best to switch to Pi? Yes, you will be able to move to Pi soon. Nest plus charts are changing from Monday, a new version which is lighter is being released by Omnesys/Thomson Reuters. I am a Nest Plus user since last 3 years. But since last month, I am unable to get the multi indicator intraday chart (live streaming) for Nifty on introduction of their new version. I only follow one chart, i,e, 7 day and 20 day moving average superimposed on a bollinger band of SD 2. I would like to know you can provide such chart, if yes, can you club it with my online Nest Trader package and what is your subscription charges? I would like to have your earliest response in this regard per return mail. Older one is good. updates taking back to old age. it is helpful for company only. reducing the bandwidth and data transfer. where is SAR indicator, Fractual choas/Darwas Box! I am a new trader & even after going through this blog was unable to start the NEST Starter pack. The login window doesnot show the Launchplus button. I am using NEST 3.11.2 & my ID is DP1518. How do I add multiple EMA indicators to one chart? Can someone pls help with my query? Sorry, we missed your comment. This is easy, Sandeep. 1. Choose Moving Average from the Indicator list on the left hand side. 2. On Moving Average, you can choose Exponential from the drop down menu. 3. After you’ve added your first EMA, you can repeat the process. 4. You can have 3 to 5 EMAs running at the same time on Nest Charts. I’m unable to see intraday charts in nest trader version 2.9.3.0. When i called to your customer care number they said that intraday charts are not available in new version.We have to press ctrl+n in plus chart to view recent candles. It’s very difficult to trade using ctrl+n in plus chart.Please help me to solve this issue and also provide permanent solution. SRM, why don’t you start using the beta release of Pi, Pi is probably the most advanced trading platform in India and we will have the final release out soon. Check this post. Thanks for your prompt reply.I have beta release of pi but bracket order facility is not available in pi.It will be great if bracket order is enabled in pi .Thanks once again. now problem is installed nest EXE. file on my laptop not support both terminal nest. one company support RSSV or otherwise zerodha. I want to both company terminal support so what cant I do ? Hai, Where can I find Nifty intraday chart in Pi software?? Does any one know how to get historical intraday chart of nifty .For eg ) 2 -may-2015 .I want historical chart is it possible ? Hmm.. I guess you should approach a data vendor for this. You can give these guys http://neotradeanalytics.com/ a shot. I think your demat account is still not opened. Can yous send an email to [email protected] with your client ID. I was referring to nifty/other shares candle charts, day wise in kite. i observe that we are unable to identify gap up/down in your charts and charts are not correct as per the real time data. can you please request your technical team to look in to the issue? Vijay, of course they are live candles and correct, can you send your contact details to [email protected], he will call and check. Nowhere it is explained as how to change duration of the chart. By default chart displayed is for 15 days. How do IO change it to 1 day or 5 days? If you are looking for charting, suggest you to check out PI or Kite, they have much better charting interface. sir try to improve the nest chart opening in a new tab for individual scripts.it will help us to enhace the user experience lot. I’m unable to plot EMA in the Candle chart using Chart Kite . Search for moving average, when you are adding, you will see a dropdown with all other sub-types – simple exponential and more. I am looking to open an account with Zerodha for 2 requirements as below. What are the requirements to run such trades.?? I mean in terms of Funds and documentation. I can’t have Zerodha Trader and Pi both on my system and use it at per my convenience. I understand that I can’t use both simultaneously. But I should have option to have it on my system and use each individually whenever I need, isn’t it? Also, where can I find the user manual for Zerodha Trader? There seems to be lot of features which needs be learnt. You can install both Zerodha Trader (NEST) and Pi on your computer simultaneously, there’s no issue with doing this. There’s no manual as such for NEST and as such, we’ve created these blogposts with different features here.